View of the brick gatehouse on Chancery Lane leading to Lincoln's Inn. The date 1518 can be read below the coat of arms of Henry VIII over the 16th-century oak doorways. The Society for Photographing Relics of Old London recorded images of Victorian London which were threatened with demolition. 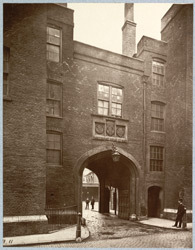 In 'Photographs of Old London' Alfred Marks explains, "When this photograph was taken it was understood that it had been resolved to remove the Gate House of Lincoln's Inn, but there is reason to believe that the intention is for the present abandoned."